The cost of solar power is falling in direct relation to the amount of solar power modules being produced. With no end in sight to this price reduction, we should soon be in a world where energy is in abundance. Moore’s Law, the law that says the number of transistors in computers doubles every two years approximately, has an equivalent in solar power called Swanson’s Law. 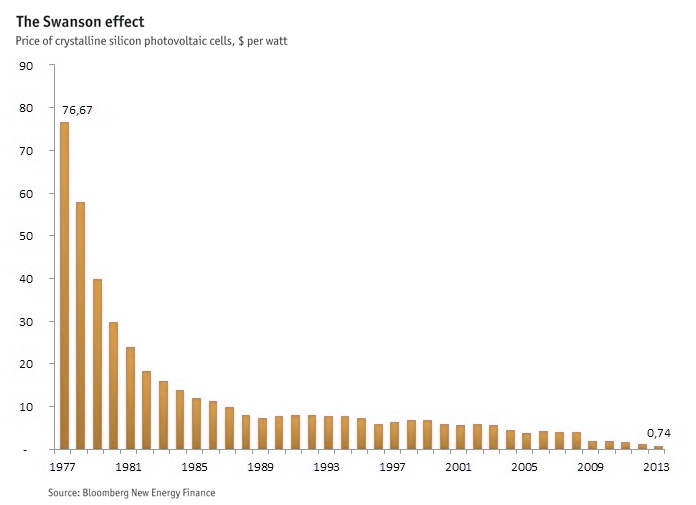 Swanson’s Law states that the price of solar panels tends to drop 20% for every doubling of cumulative shipped volume. This leads to a positive feedback loop of lower prices meaning more solar pv installed, leading to lower prices, and so on. 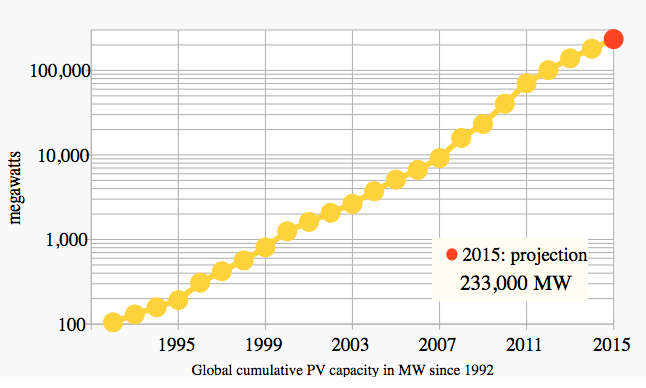 And consequently, as the price of solar panels drops (see top graph), the amount of installed solar globally has increased exponentially (see chart on right). This positive feedback loop is manifesting itself in China, where in May of this year the National Development and Reform Commission announced that China would target a more than tripling of its installed solar capacity to 70 gigawatts (GW) by 2017. While in India, Prime Minister Narendra Modi and his cabinet recently approved increasing the country’s solar target fivefold to a goal of reaching 100GW by 2022. To put those numbers in perspective, according to the International Energy Agency’s Snapshot of Global PV Markets 2014 report, the total amount of solar PV installed globally reached 177GW at the end of 2014. And it is not just South East Asia, Brazil and the US this week reached a historic climate agreement that will require. the US to triple its production of wind and solar power and other renewable energies. Brazil will need to double its production of clean energy. The figures do not include hydro power. And according to GTM Research, by 2020 Europe will install 42GW and account for 31% of the global solar market. Is this having a significant effect on pricing? Absolutely it is. The price for installed solar hit another new low at the end of last year when Dubai utility DEWA awarded a contract to Riyadh-based consortium Acwa Power to build and operate a 200MW solar park for a guaranteed purchase price of 5.84US cents per kWh for 25 years. To fully appreciate the significance of this price, it is necessary to understand that the price of natural gas – which generates 99% of the UAE’s electricity – stands at 9 cents. So, in the United Arab Emirates at least, solar power is currently 65% of the cost of the next cheapest form of electricity production. And its price will continue to decline for the foreseeable future. So, solar power is cheap (in some cases 65% of the cost of the next nearest competitor), its price is continually dropping, and with 100’s of gigawatts of orders coming into the pipeline, the price reductions may even accelerate. In this scenario we are headed into a world where solar power rates, for all intents and purposes, approach zero. In that situation, the question becomes, what do we do in a world where energy is in abundance?